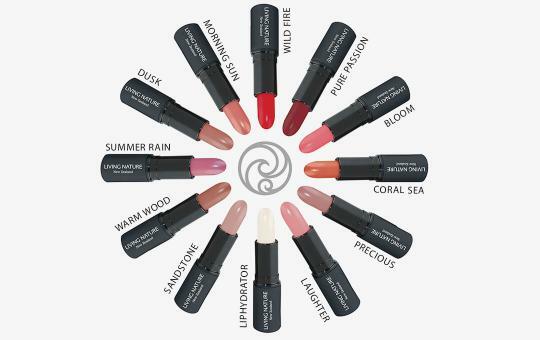 Essbare Lippenstifte von LIVING NATURE in 11 Farben. 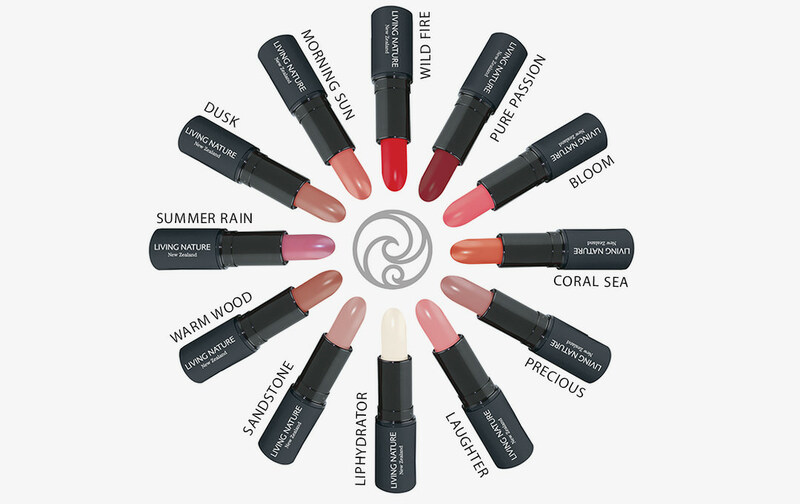 Essbare Lippenstifte von Living Nature in 11 frischen, dezenten und kräftigen Naturtönen. Living Nature verwendet für seine Lippenstifte (Lipsticks) die hochwertigsten Rohstoffe der Natur wie Bienenwachs, Apfel- und Traubenkernöl sowie unterschiedliche Mineralien. Gut zu wissen, dass man alle Rohstoffe bedenkenlos essen kann! Nach Bedarf Lippenstift auf die Lippen auftragen. Ricinus communis seed oil, Caprylic/capric triglyceride, Euphorbia cerifera wax, Mica (CI 77019), Iron oxides (CI 77491), Cera alba, Titanium dioxide (CI 77891), Copernicia cerifera wax, Iron oxides (CI 77492), Tocopheryl acetate, Vitis vinifera seed oil, Pyrus malus seed oil, Squalane, Glycine soja oil, Tin oxide. Ricinus communis seed oil, Caprylic/capric triglyceride, Titanium dioxide (CI 77891), Euphorbia cerifera wax, Cera alba, Carmine (CI 75470), Copernicia cerifera wax, Iron oxides (CI 77492),Tocopheryl acetate, Iron oxides (CI 77491), Vitis vinifera seed oil, Pyrus malus seed oil, Squalane, Glycine soja oil. Ricinus communis seed oil, Caprylic/capric triglyceride, Euphorbia cerifera wax, Cera alba, Mica (CI 77019), Iron oxides (CI 77491), Titanium dioxide (CI 77891), Iron oxides (CI 77492), Carmine (CI 75470), Copernicia cerifera wax, Tocopheryl acetate, Glycine soja oil, Squalane, Vitis vinifera seed oil, Pyrus malus seed oil. Ricinus communis seed oil, Caprylic/capric triglyceride, Euphorbia cerifera wax, Titanium dioxide (CI 77891), Mica (CI 77019), Cera alba, Copernicia cerifera wax, Carmine (CI 75470), Iron oxides (CI 77492, CI 77491), Tocopheryl acetate, Iron Oxide (CI 77499), Pyrus malus seed oil, Squalane, Vitis vinifera seed oil, Glycine soja oil. Caprylic/Capric triglyceride, Ricinus communis oil, Euphorbia cerifera wax, Mica (CI 77019), Cera alba, Copernica cerifera wax, Iron oxide (CI 77491), Titanium dioxide (CI 77891), Iron oxides (CI 77492, CI 77499), Tocopheryl acetate, Pyrus malus seed oil, Squalane, Vitis vinifera seed oil, Glycine soja oil. Ricinus communis seed oil, Caprylic/capric triglyceride, Euphorbia cerifera wax, Mica (CI 77019), Cera alba, Copernicia cerifera wax, Carmine (CI 75470), Titanium dioxide (CI 77891), Iron oxides (CI 77491), Iron oxides (CI 77492), Tocopheryl acetate, Pyrus malus seed oil, Squalane, Vitis vinifera seed oil, Glycine soja oil, Iron oxides (CI 77499). Ricinus communis seed oil, Mica (CI 77019), Caprylic/capric triglyceride, Euphorbia cerifera wax, Cera alba, Titanium dioxide (CI 77891), Iron oxides (CI 77491), Iron oxides (CI 77492), Iron oxides (CI 77499), Copernicia wax, Tocopheryl acetate, Glycine soja oil, Squalane, Vitis vinifera seed oil, Pyrus malus seed oil. Ricinus communis seed oil, Mica (CI 77019), Caprylic/capric triglyceride, Euphorbia cerifera wax, Titanium dioxide (CI 77891), Cera alba, Iron oxides (CI 77491), Iron oxides (CI 77492), Copernicia cerifera wax, Tocopheryl acetate, Carmine (CI 75470), Silica, Glycine soja oil, Squalane, Pyrus malus seed oil, Vitis vinifera seed oil, Iron oxides (CI 77499). Ricinus communis seed oil, Caprylic/capric triglyceride, Mica (CI 77019), Titanium dioxide (CI 77891), Euphorbia cerifera wax, Cera alba, Iron oxides (CI 77492), Carmine (Cl 75470), Copernicia cerifera wax, Iron oxides (CI 77491), Iron oxides (CI 77499), Tocopheryl acetate, Pyrus malus seed oil, Squalane, Vitis vinifera seed oil, Glycine soja oil. Ricinus communis oil**, Cera alba**, Copernicia cerifera wax**, Cocos nucifera oil**, Glyceryl behenate, Mica, Melia Azadirachta flower extract, Melia Azadirachta seed extract, Coccinia Indica fruit extract, Tocopherol, CI 77491. **Certified organic. 100% natural origin. 90% organic of total. Ricinus communis oil**, Cera alba**, Copernicia cerifera wax**, Cocos nucifera oil**, Glyceryl behenate, Mica, Melia Azadirachta flower extract, Melia Azadirachta seed extract, Coccinia Indica fruit extract, Tocopherol, CI 77491, CI 77499. **Certified organic. 100% natural origin. 90% organic of total.